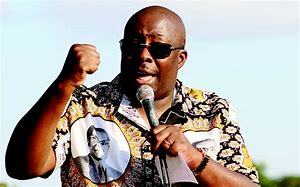 Zanu-PF will neither lose sleep nor be intimidated by the recent rantings of Saviour Kasukuwere and his G40 cabal that they are ready to take the party head-on, a Politburo member has said. Speaking during an interface with war veterans, war collaborators and detainees in Bindura last week, Zimbabwe National Liberation War Veterans Association (ZNLWVA) secretary-general Victor Matemadanda said G40 members like Jonathan Moyo should not fool themselves by thinking they are greater schemers than Zanu-PF. “Kasukuwere is saying it will be rough; to who?” he asked. “As a party, we will not lose sleep or be disturbed from making babies by a goat which is rubbing its body against the bedroom walls. Kasukuwere is a hopeless man and there is nothing he can do to the party. “Professor Jonathan Moyo thinks he is a great schemer. Let us see him scheme while out there in the cold, outside the country. “Once you are beaten and driven out of the village and you tell yourself that you are going to scheme, what are you going to scheme, don’t fool yourself.